I’d not really paid much attention to these TV and film compilation covers until a recent donation of vinyl (courtesy of Tim Joseph!) threw up a few more, and made me check them out en masse. The albums are all budget affairs, mostly cover versions of the original themes, and the sleeves all feature montages of the actors. These are clearly inspired by film posters which have long featured this sort of painted montage in the days before it was possible to manipulate photographs so easily. But being budget albums, the results vary considerably. 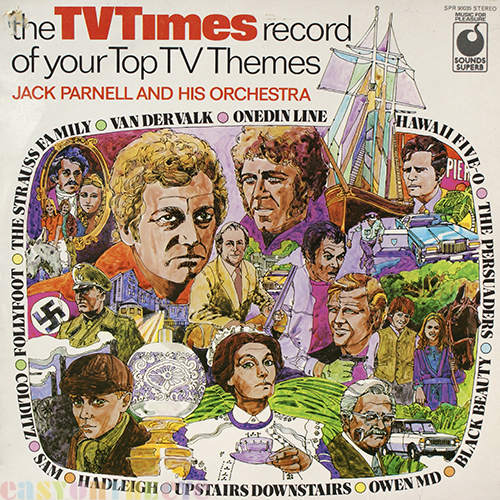 The TVTimes album tracks were supposedly chosen by readers of the TV listings magazine, and recorded by Jack Parnell’s Orchestra. The cover is well done, pen and ink (possibly Rapidograph) outlines filled with washes of colour, laid out in the shape of a TV screen. Issued in 1974 it was drawn by Barry Elphick. Barry worked for a number of agencies in London during the 60s and 70s (having graduated from Kingston College of Art in 1956), and examples of some of his excellent illustration work are kept by the V&A. Sounds Superb was part of the Music For Pleasure label from EMI. 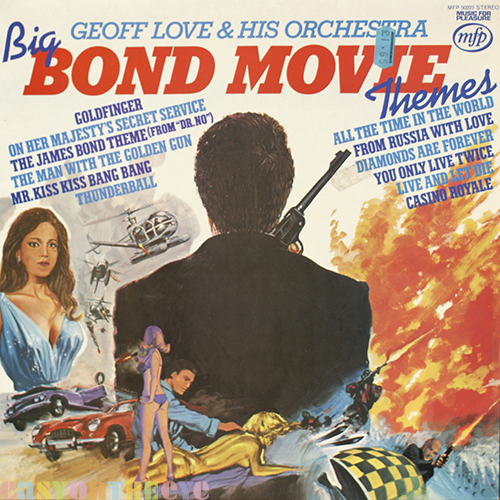 A more directly movie poster influence can be seen on the Big Bond Movie Themes album, a self-explanatory set of cover versions from MFP dated 1975, this time by Geoff Love and his Orchestra. 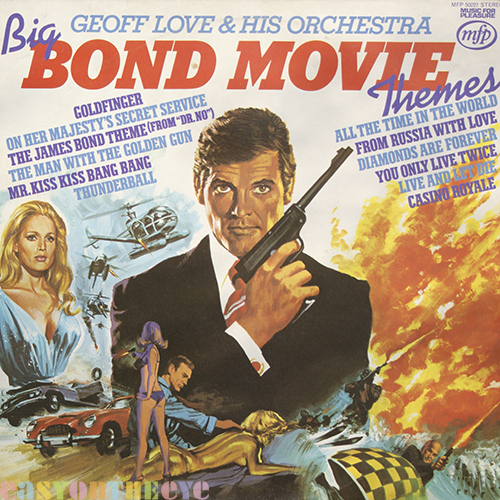 The cover borrows heavily from actual Bond film posters, the image of Roger Moore in particular. This is explained by the fact that it was done by Tom Chantrell, a British illustrator who painted over 3,000 film posters from the 1930s onwards (he died in 2001) including One Million Years BC and Star Wars. It is a mark of MFPs standing that they would approach Tom to do the cover. Quite what happened next I’m not sure, but one suspects a call from the owners of the Bond franchise complaining of copyright infringement. So the cover was hastily reworked; Bond turned his back, Ursula Andress found herself painted over, and the Sean Connery figure massaging Honor Blackman was also changed. This was not done by the original painter! Given that Saga was a low-end budget label, the sleeve illustration for their Famous TV Themes album isn’t bad. 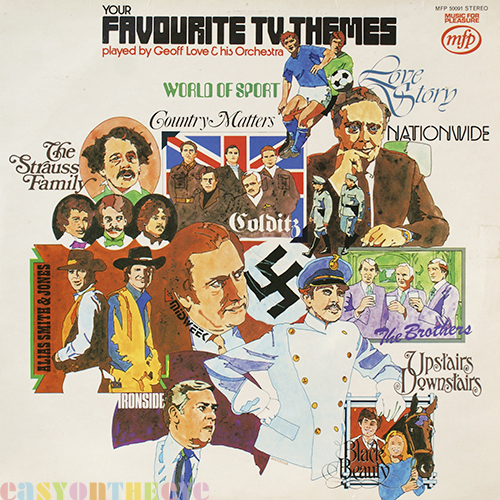 Recorded by The Graham Walker Sound and issued in 1969, and the cover features stars of the TV shows with an outline guide on the back to ID them all, though as it’s a proficient enough piece if you recall the shows you should recognise most of them. The illustration (in coloured pencils) was done by Jack Mooring, and would look better but the repro house has screwed up the separations so it is printed slightly out of register! 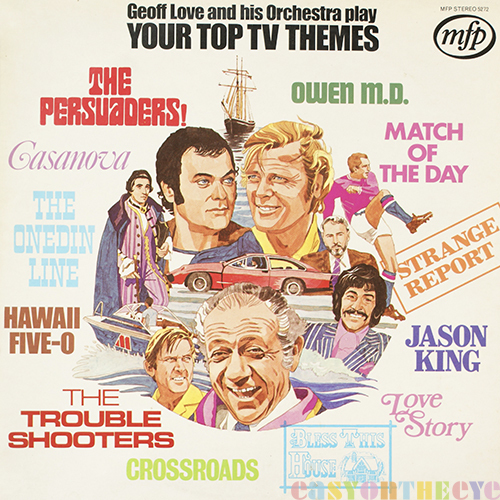 Geoff Love was at it again for MFP’s Your Top TV Themes and Your Favourite TV Themes album in 1972 and 1973 respectively. These album were popular as it wasn’t easy to find much TV music on vinyl at the time. You would sometimes see a theme issued as a single, but they were rarely hits so you had to hunt for them. The albums sold to people who liked the tunes, and it was undoubtedly a golden age for theme music. The first cover is by David Smee, while the second illustration is by Geoff Hocking. Geoff worked on a lot of album covers for the World Record label (his must have book on the subject is reviewed on this site), also later owned like MFP by EMI. Here turns a deft hand to a montage in ink and colour wash, with the programme names worked in using various decorated typefaces. Not all such sleeves were as well executed as the last two here show. 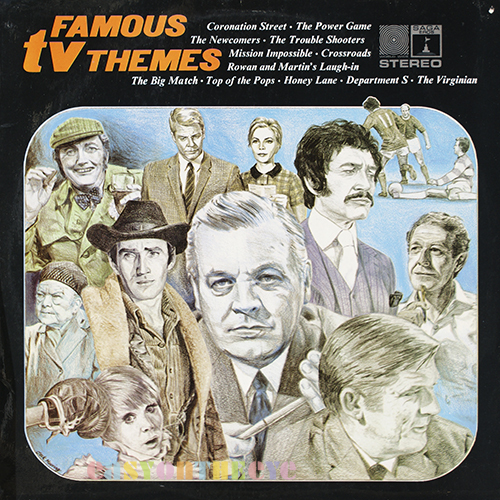 Top TV Themes on the Contour label has a more abstract approach to the illustration but isn’t as well balanced as those above. 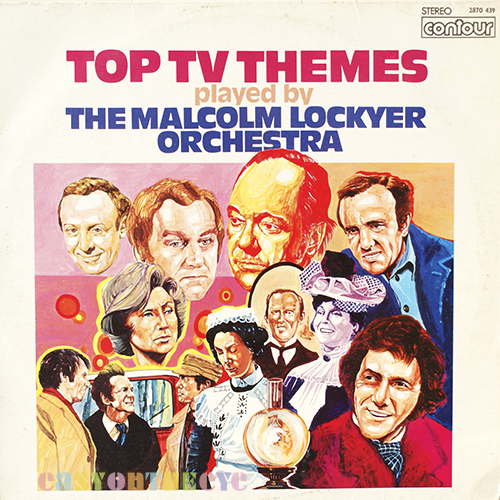 It dates from 1975 and the music is performed by the Malcolm Lockyer Orchestra. 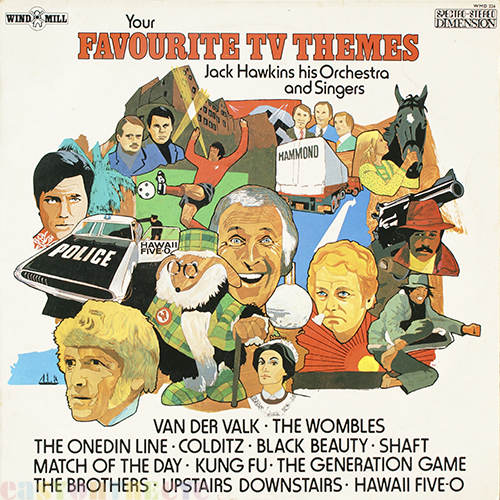 Worst of the lot is the illustration for Windmill Records’ Your Favourite TV Themes (recorded by Jack Hawkins, his Orchestra and Singers), though even here the characters are strong enough to remain mostly recognisable at the time it was issued back in 1974.